Quickly create beautiful online surveys for customer experience, product feedback, market research and more. 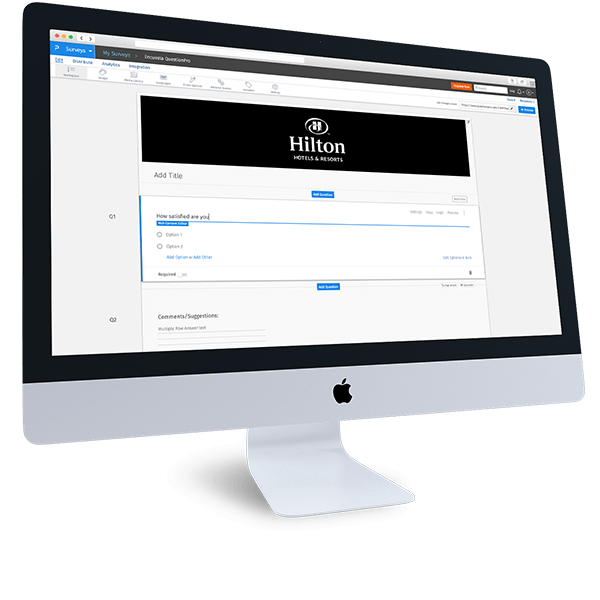 Use our easy point and click tools to customize your survey's theme, add logos and images, change fonts and much more. Choose from 30+ question types or instantly create your online survey using a professionally designed survey template. Take advantage of advanced survey platform with features like multilingual surveys, sophisticated logic, and powerful integrations. With enterprise ready survey tools for managing team roles and permissions, we make collaboration easy for survey creation and analysis. Our best in class survey taking experience will delight customers and improve response rates. Collect meaningful survey data through any channel including web, email, mobile, SMS surveys, social media and more. Use our mobile survey app to collect data offline which is ideal for field research, trade shows, events, and remote locations. Push survey responses directly to your CRM using custom APIs or our software integrations with Salesforce, Microsoft Dynamics, Hubspot and many more! Our team will help you source the highest quality survey respondents for your research project. Don’t lose a minute with our real-time survey insights. Sharable dashboards and analysis will help you turn data into action in a flash. Perform survey analysis with our powerful survey software tool for trend analysis, conjoint, segmentation, and pivot tables. We make analysis of text survey responses easy with a full set of tools to help you sort through open response data. Export your survey data directly to other software tools such as Excel, Google Sheets, SPSS, or CSV. Our world class customer service team is available 24 hours a day to make sure you can get your research project done. Run sophisticated quantitative and qualitative research projects that deliver real-time results with QuestionPro’s market research survey software. Leverage our advanced capabilities such as conjoint, maxdiff, custom logic, and quota management for your market research surveys. Dig deep with our powerful segmentation and statistical analysis or export your data formatted for statistical packages such as R or SPSS. 40% of HR Professionals say they “rarely” or “never” do anything meaningful with the results of their employee surveys. Are you one of them? It’s not your fault. It’s the survey’s fault. QuestionPro’s Workforce platform brings an integrated employee survey software solution that produces culture, engagement, and employee experience data that you can act on. Be a hero to your customers by leveraging QuestionPro’s advanced customer survey software platform to capture feedback surveys across every customer interaction. Use our sophisticated tools to define organization roles and products. Customize the data aggregation engine to deliver insights and follow-up actions across all levels of your company. Online survey communities can boost sales by 50%! QuestionPro's community survey software can help you create engaged communities, collect real-time customer insights, and positively impact your business. From targeted surveys, polls and questionnaires to conducting qualitative research using discussions and IdeaBoard we have the toolkit to help you find the insights needed to make better decisions. Get access to millions of survey participants around the globe who are pre-screened and highly qualified to participate in various research initiatives. With 22 million panelists across 32 countries, QuestionPro Audience can help you complete your research studies in minutes. Collect survey data anywhere, anytime. Even offline. QuestionPro’s mobile survey software offers an industry-leading offline survey app can be used to collect data anywhere regardless of location and connectivity. Our app seamlessly integrates all the advanced features of our web software and is fully compatible with all devices and mobile operating systems including iPad, iPhone, and Android. Use the free version of our survey software to create a survey in minutes! Just pick a survey from 250+ free online survey templates for market research, customer satisfaction surveys, academic research, community-based surveys and much more! With live customer support 24 hours a day, we are always here to make your life easier. You can access us live 24*7, 365 days a year. Reach us anytime, from anywhere via online chat, email or phone, and our representatives will be there to assist you. Use QuestionPro's online survey software and take advantage of our wide range of point-and-click online survey logic without spending hours learning how to use it - Survey branching and skip logic, extractions, text piping, survey looping, and randomization. 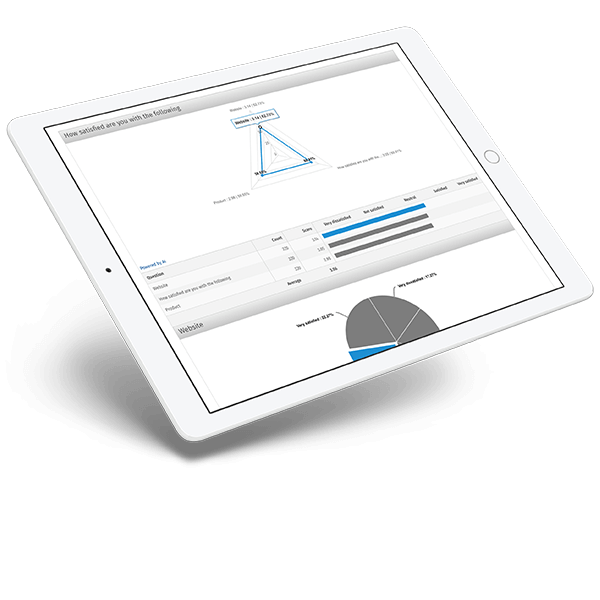 Our iPad and tablet apps are designed specifically to allow for data collection and analysis everywhere you go. 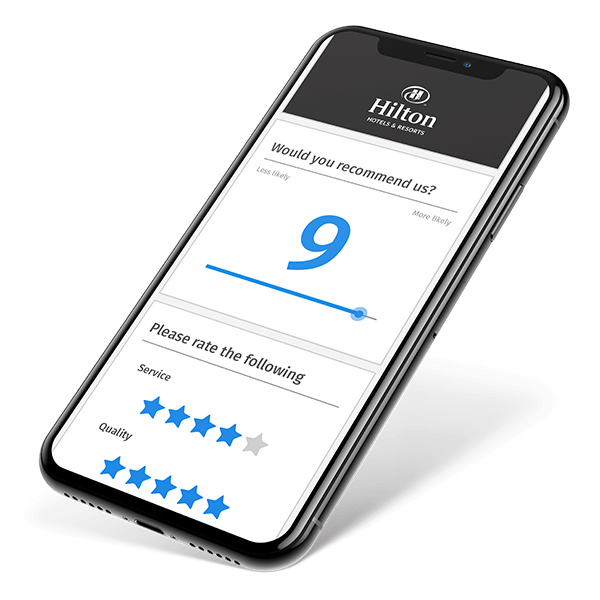 All QuestionPro surveys are all mobile-optimized for smartphones and tablets with additional options for getting the QuestionPro Survey App for both online and offline surveys. Want to conduct survey research in local languages? Our survey platform provides you with over 100 languages to choose from so you can capture exponentially better responses using the most spoken dialect in the target market. Multilingual is available on all web surveys and email surveys. Get automated and elegant reporting dashboards ready for you to view and share with your team in real-time. You can also analyze survey results with ease and export your survey data in variety of supported methods such as Excel, SPSS and CSV. QuestionPro offers seamless survey data and analytics integration with Salesforce, Microsoft Dynamics, Tableau and several other global platforms with robust API that puts you in complete control of your survey feedback data. Get the unique QuestionPro advantage with integrated online panel management built right into our online survey software. Create your own panel and conduct focus group surveys, recruit or purchase new members, set reward systems, conduct qualitative text analysis, etc. Need help with a survey project? QuestionPro offers a wide variety of customized professional services for business surveys including logic and custom scripting, custom design, professional survey creation and customized training and support. Your free account never expires. No credit card required.